"The sport of football can be a vehicle of education for the values of honesty, solidarity and fraternity, especially for the younger generation," Benedict told Italy's Gazzetta dello Sport newspaper back in 2008. His successor, Francis has echoed those remarks, and even promised not to pray for Argentina. But a Catholic who met Pope Francis this week to discuss more serious matters said that the pontiff seemed to be secretly pulling for his home team. "He absolutely wants for Argentina to win," Peter Saunders, a victim of sexual abuse from England who met Francis on Monday, told the Boston Globe. "He didn’t say it out loud, but you could see it in his eyes, he’s a closet fan." And earlier this month, before Argentina played Switzerland, Francis jokingly told his Swiss Guards, "It's going to be war!" 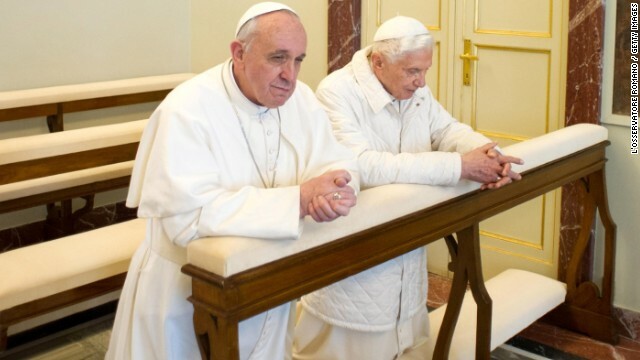 It will be interesting to see what the Vatican says about the Argentina-Germany matchup. The men are known to be close, with Francis saying he and Benedict "are brothers." Maybe the "brothers" will put a little wager on the high-stakes soccer match, or maybe this just means that God has a really good sense of humor. On Thursday, Vatican spokesman Rev. Federico Lombardi dashed hopes for a World Cup papal watch party, but left often the possibility that something could be afoot. "We'll see in the coming days," Lombardi told reporters. If World Cup final is Germany and Argentina, then it's Pope against Pope. Awaiting Benedict-Francis shootout.